OKLAHOMA CITY, Okla. (Reuters) – Oklahoma teachers carried their strike into a second week on Monday, with educators gathering at the state capitol after a $44 million tax and revenue package passed last week fell short of their demands to boost school spending. Teachers are pushing for $200 million in increased annual education funding in a state that ranks among the lowest in school spending in the nation. A strike by West Virginia teachers ended in a raise last month and has prompted educators in other states to consider similar action. The strike has garnered support from many of the state’s school administrators and much of the public and affected more than 500,000 students statewide, with 66 school districts expected to close. The union has said the walkout would end if lawmakers removed capital gains exemptions, which could bring in an additional $100 million in revenue, and implemented a hotel tax that would bring in an estimated $50 million. “If they can do those two items, that would be significant,” said Doug Folks, a spokesman for the association. 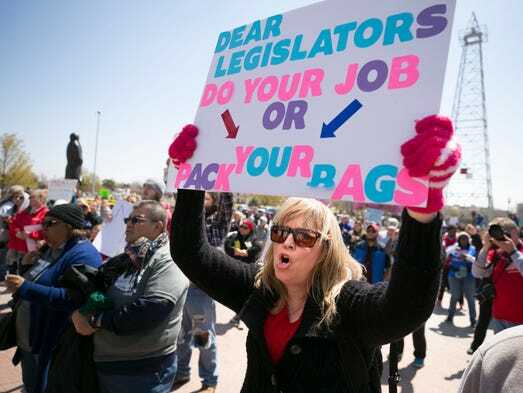 The strike has garnered strong public backing, with a statewide survey from the Sooner Poll agency showing that 72.1 percent of respondents supported the walkout. Opponents of the tax hikes, including Oklahoma Taxpayers United, argue that lawmakers could boost education spending by cutting bureaucracy and waste rather than raising taxes. Last month, lawmakers approved the state’s first major tax increase in a quarter century, a $400 million revenue package that raised teacher pay by an average of about $6,000. But the teachers are seeking $10,000 over three years. Even with the pay raise approved by lawmakers, their mean salaries would be lower than teachers in every neighboring state, U.S. Bureau of Labor Statistics data showed. Oklahoma has the lowest median pay among states for both elementary and secondary school teachers, according to 2018 bureau data. The minimum salary for a first-year teacher was $31,600, according to state data. Posted in Advocacy, Education Budget, Educators Protest, Funding For Education, Pension & Salary and tagged "Standing Strong for Public Education", #iBelieve, Accountability, Accountability System, Advocacy, Department of Education, Diversity, Education, Education Funding, English Language Learners, Equity, Every Student Succeeds Act (ESSA), Failing, Failing Schools, Federal Education Policy, High-Needs Students, NEAExecutiveCommittee, Pension, Pensions, Public Education, School Choice, Students, Testing and Accountability. Bookmark the permalink.